← History, Astronomy, and Needle Felting! A Felted Moon . . . Not quite! Alright, I promised a moon. However, the felted moon did not turn out the way that I intended it to. I was lacking some key colors to really make this miniature moon realistic or for that matter even slightly resemble it. So I decided rather than hide my little felted moon from the eyes of fellow felters, that I would share my failure with you. My moon is sitting atop my white wool baby jar in the top righthand corner! 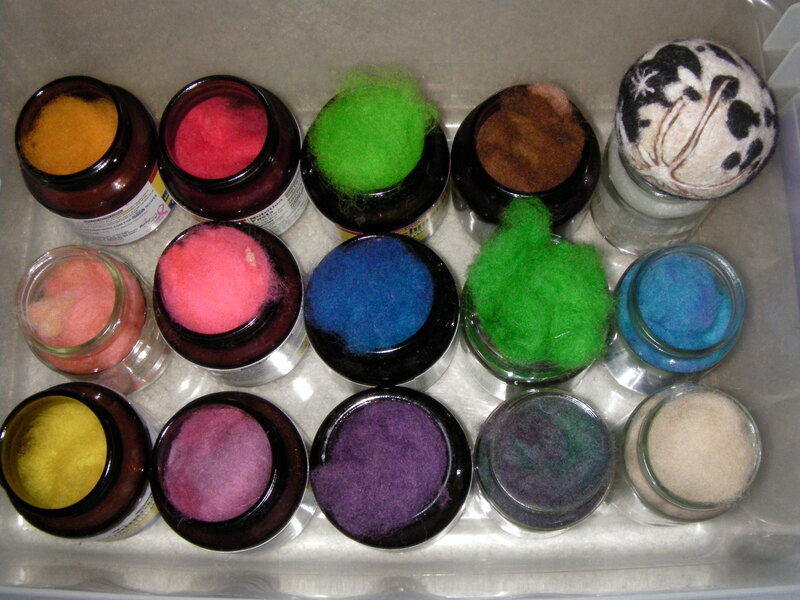 Yes I use baby jars and yeast jars to hold my colored wool. It works great; I can easily see the palette of colors I have to choose from. My husband dyed my wool for me a few months ago and I’ve been working off this color palette for some time now. The colors turned out fantastic as you can see; we used a method that utilizes “Wilton” food coloring to dye the wool. By the way “Wilton” coloring is excellent for getting vivid colors on cakes or cookies. It really makes a red or black icing which is amazing; generic food coloring can’t make those bold colors. The ability for this brand to make such vibrant colors is why I chose it for my wool. However, I have not yet found a way to make gray wool. And a moon without gray wool looks ridiculous. Therefore, my new goal is to come up with a way to dye wool gray and share this with everyone in the future. Once I have successfully dyed a batch of gray wool I can use it to tweak my moon design and then I can show you the new improved version. If anyone has had any success with dying their own wool gray, please comment below; I could really use the advice. Otherwise, if you’re in the same grayless boat as me, stay-tuned and I will wow you in a few weeks! So you heard it right, a “how-to” dye wool post is up and coming. See you soon!